Today, on day 3 of the Milan Fashion Week, I thought to give you a snapshot of what’s showing on The Runway in terms of fashion womens wear for the upcoming year. In particular, I want to show you that the sweater dress garment that I’m so in love with these days, and the notion of stripes, will be in fashion for some time to come. Max Mara’s collection for this coming Fall-Winter is in beige. Monochrome or paired with black. As well: wide shoulders, flat sporty shoes, long skirt hem length, lots of horizontal stripes, and very bulky, over-sized coats, tops and other garments, ton-sur-ton. Max Mara’s Sweater Dress is in mustard and caramel colored stripes. It’s worn over a metallic copper body. Anteprima’s sweater dress number 1 is a classic long sweater, very similar in model to the free sweater dress knitting pattern that I’ve posted last week with the wide scooped neckline. Looks like it’s textured by mixing grey-brown with black yarn. 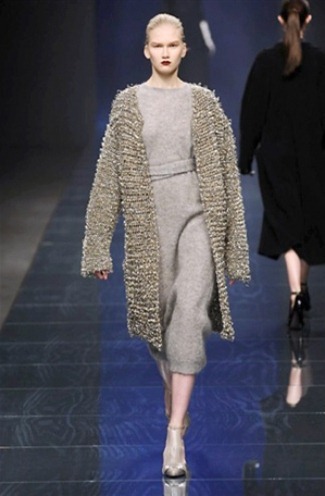 Anteprima’s sweater dress #2 seems like it’s made with angora wool. simple grey. Clean line. Belted with woolen belt to accentuate the waist. Covered with a thick, over-sized, coarsely knitted cardigan of in silver gray. Monochrome. Anteprima’s third sweater dress had an extra-long skirt section (half way down the ankles), and 3/4 length sleeves with simple inserts. Simple, fine knit. Grey. Clean lines. Belted to accentuate the waist. Monochrome. Highly textured long dress with altered V-neckline, 3/4 long sleeves, belted. Skirt line reaches till mid-calves. Monochrome black. Bluegirl’s sweater dress is ombre, ranging from marine-blue to teal. Color change at waist-level. 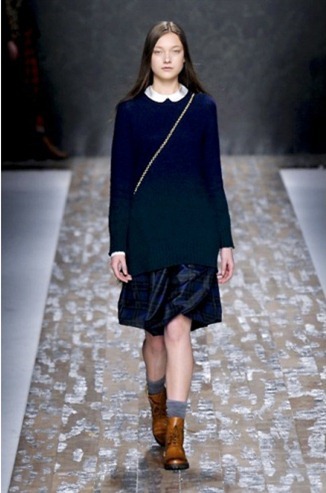 Sweater is line a mini-dress, and is lengthened by blue/green/black tartan silk balloon skirt. The sweater dress is shorter at the front. Fendi’s collection for the coming Fall – Winter season is futuristic, with lots of unnatural, large rounded shapes in the garment, setting its women’s wear apart from the rest. Charcoal grey. Monochrome outfit. Belted, to accentuate the waist. Gucci features a simple, feminine knitted dress design with padded square shoulders and a knit ribbing to accentuate the waist. Skirt hem length reaches just below the knee. Long sleeves. Monochrome burgundy. Krizia’s sweater dress is again beige (like the Fendi collection). There is extra emphasis on the shoulders and waist. 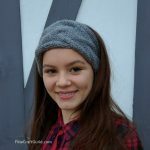 The top section is double-layered with both an oversized V neckline and below this, a cowl. Full length sleeves. Paired with black. 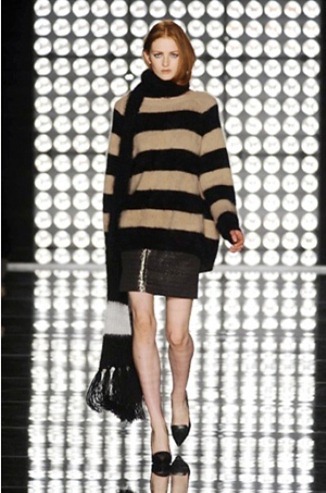 Les Copains’s sweater dress is a simple, horizontally striped, baggy sweater, with extra long arms and body length. In beige and black. Paired with metallic shiny skirt and ultra-long black scarf with fringe and color-block. 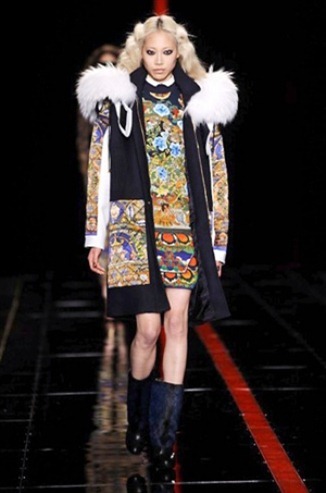 Just Cavalli’s sweater dress is half way on the thigh, and reminiscent of a Buddhist thangka painting. Hope you enjoyed this selection of womens fashion for the upcoming Fall. 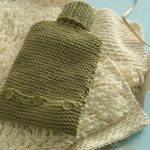 Now, it’s time to get those knitting needles and/or sewing machine out, flip through my increasingly long list of sweater dress patterns, and make your own sweater dress. Or three or four. As world’s most famous fashion designers indicate: this Fall Winter, many sweater .dress styles possible! 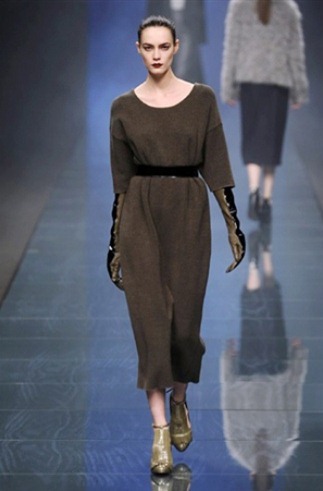 which you could use to make the Max Mara and Gucci & Bluegirl dresses Adjust the details: i.e. omit the union jack and add stripes. For the Bluegirl dress, you must increase at the hips to create a more balloon shape and adjust the front hem line to be shorter. Switch yarn colors at the waist. which you could use to make a dress that more or less works like the one of Les Copains. As well, to understand how to make an oversized V-neckline. to make a sweater similar to Anteprima’s first featured dress. I also want to show another pattern, of our tuxedo sweater dress knitting pattern, which shows an asymmetrical hem line, ~ i.e. 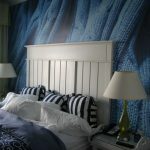 a feature that was popular among many designers in their collection for this year. Tuxedo and other tailored jackets, paired with woolen cardigans and sweater dresses were popular. In the collections of the various world-famous fashion designers there were also quite a few knitted cardigans with collars just like this one. Click link for the free knitting pattern for this fashionable womens cardigan.